Unfortunately the "Free Emoji Cushion Pillow" offer is no longer available. 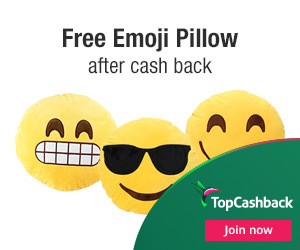 Get a free Emoji Cushion Pillow. The cushion is made of thick plush which is extremely soft and comfortable. It can be used as cushion, pillow, or purely as a plush toy to express yourself. 3. Add one (1) Emoji Round Soft Cushion Pillow" priced for $6.49 to your cart and checkout. Do not add anything else to your cart. 5. In about 14 days $6.90 cashback will post in your TopCashback account. Offer valid through February 20, 2019.